Carterra, an expert in high-throughput surface plasmon resonance (SPR), will continue its popular seminar series on accelerating antibody discovery with a new event in Cambridge, Massachusetts on December 5th, 2018. Building on the success of its recent US West Coast seminar in San Francisco, Carterra will host invited speakers from Genentech, Adimab, Janssen Biotherapeutics and Amgen, alongside presentations from its CSO, Yasmina Noubia Abdiche, PhD, and application scientists. 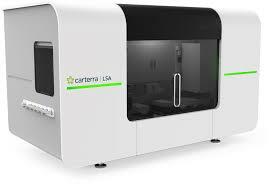 The Carterra LSA array SPR instrument enables the rapid and detailed screening and characterisation of large antibody libraries at the earliest stage of the discovery process. By performing both kinetic studies and epitope binning on all members of a library, rather than just a small subset, unique candidates can be identified to provide epitope diversity and IP coverage. The result is a streamlined and highly informed lead selection process. Crucially, researchers are now able to see greater detail within their antibody library, minimizing the risk of missing potentially high-value antibodies. The recent West coast seminar held in San Francisco attracted over 50 attendees from a range of commercial companies and academic institutions, highlighting the increasing adoption of the Carterra LSA platform. With many opportunities for stimulating discussions and several new collaborations forged, presentations included: Jack Bevers III, Senior Scientific Researcher at Genentech, on the implementation of high throughput SPR into antibody discovery and engineering workflows; and Jacob Glanville, Chief Scientific Officer of Distributed Bio, who spoke about how computational immunoengineering and high throughput kinetic screening can realise the dream of a one-week antibody discovery cycle. Further high profile industry leaders are scheduled for the December 5th seminar.